With its enticing and colourful design and its fascinating information, this is a book that children will want to pore over—either at home, in the classroom or on a road trip. 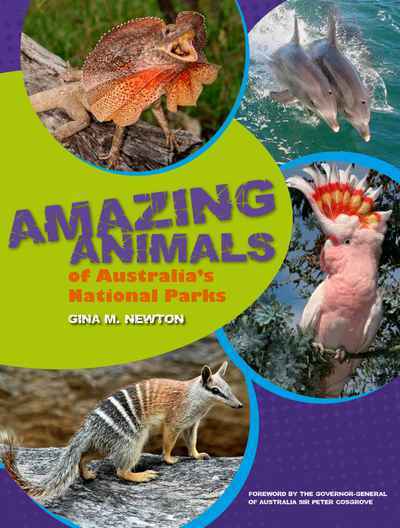 This book brings together 55 national parks, selected across all Australian states and territories, and over 120 animals. It is divided into seven sections according to habitat (woodlands and grasslands; forests; rainforests; arid zones; mountains; wetlands and waterways; coasts, oceans and islands), each including a number of national parks and a selection of the fish, reptiles, frogs, birds and mammals that inhabit them. At the end of the book is a section on ‘little critters’—beetles, spiders, butterflies, grasshoppers, bugs and so on. Each habitat section opens with photographs of the featured national parks and a description of the habitat. Each animal has its own page, which has a stunning colour photograph of the species, a map of its distribution range, its conservation status and scientific information about the species. The information is divided into the following sections: ‘Fast Facts’ gives you all the vital statistics, such as size, lifespan and number of young; ‘Where Does It Live?’ tells you where in Australia you can find the species and provides details about its home; ‘What’s Its Life Like?’ tells you a bit about how the animal moves, behaves, eats and has young; and ‘Interesting Info’ has quirky and fascinating facts.